A wacky young scientist stars in Gold Lab, a 5 reel, 25 payline video slot from Quickspin. Boasting quirky design, the highlight of this science-themed title is the Golden Bonus which transforms ordinary symbols into wilds as well as awarding respins. Play on your computer, tablet or mobile from between 10p and £100 per spin. Quickspin video slots are usually good to look at and that’s true of Gold Lab. The action here takes place in a cartoon laboratory. You’ll see lower value gemstones spinning around the reels alongside four brightly coloured beakers. There’s also a wild that substitutes for everything bar the scatter. Watching over proceedings is an animated scientist. The main feature here is the Golden Bonus feature – each potion bottle can appear with a red background behind it. Land 3 matching red-backed scatters on reels 1, 3 and 5 to trigger the feature. The red-backed beakers from the triggering spin turn wild, as do any matching beakers. A new payout is made. You’ll then be awarded 4 respins with the beaker from the triggering spin wild throughout. There’s a beaker meter to the side of the reels. Land a Golden Bonus scatter symbol during a respin, and it will make the associated beaker wild as well as adding an extra respin to your total. In theory, you could end up with all 4 beakers wild which can deliver some potentially explosive results. As far as variance goes, we’d put Gold Lab in the medium to high range. Expect spells when the scientist’s experiments will come to very little. 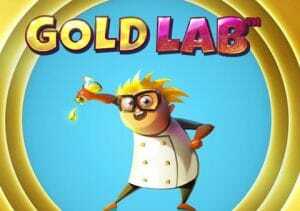 Trigger the Gold Bonus feature and turn multiple beakers wild and the scientist can deliver some sparkling results – with 413 times your bet on each spin. Gold Lab is quite an unusual game. The cartoon visuals work well enough and the cheesy backing track matches the slightly anarchic theme. There isn’t much in the way of extras but the Golden Bonus feature offers some decent potential. Combine the wild beakers in the feature and the Gold Lab can deliver some potentially explosive results. If you like the science theme, Yggdrasil Gaming’s Alchymedes and Novomatic’s Reel Attraction are recommended.